I’ve only exhibited work once before. The Exhibition was in aid of a Charity and the process was quite straightforward. Receive the invitation, send jpegs of my proposed submission for general approval, then pay a sum of money for each piece of work exhibited. The Charity would also receive a percentage of any proceeds. I turned up on installation day with two framed photographs, handed them over and attended the private preview evening. Although I didn’t sell anything I was excited to see my work on the display board and people actually looking at, and talking about, it which compensated for the stress in the lead-up – worrying whether my work was ‘good enough’ and having to think about print quality and the right frames. At the time I also wondered about the two organisers/curators and how much work was going on behind the scenes. Well, now I know – having been involved in the organisation of OCA Thames Valley Group Exhibition “Time”. I was thinking the other day about how organising an exhibition is like planting seeds from an unlabelled packet, nurturing them for two years, wondering what the flowers would be like and then seeing them bloom for just two weeks. In October 2016 some of us from OCA Thames Valley group met up at the Brighton Photo Biennial and Teresa mooted the idea of putting on an Exhibition of new bodies of work which would not be connected with ongoing coursework. I volunteered to be on the Steering Group which began meeting at the beginning of 2017 and comprised Teresa (as co-ordinator), Dawn, Monica, Sue and myself at first and then joined by Jonathan as our Treasurer. The theme of “Time” emerged after much discussion and we also thought it would be a good idea call ourselves a different name for exhibiting purposes. We needed a Project Brief and prospective budget alongside the funding application to the OCA Student Association (OCASA) and a planning calendar was also drawn up by Monica to keep us on track with the process. With a scattered sub-group, planning meetings were a mix of virtual and actual, with emails in between, plus the use of a virtual “Basecamp” provided by Dawn to lodge important papers. Each of us took on different roles to meet our action plan as it progressed, mine being that of co-curator with Dawn who had already had experience of exhibition organisation and, later on, I mainly liaised with exhibitors and the Lightbox regarding the Exhibition arrangements. 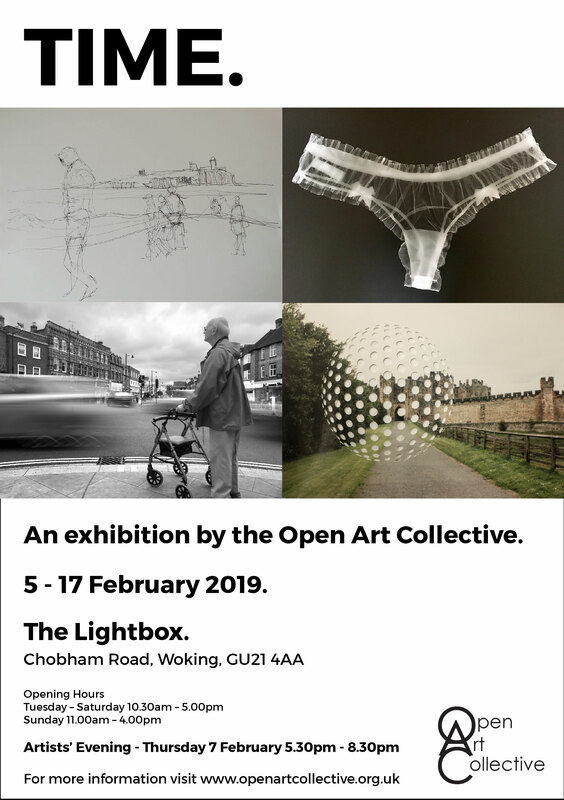 Two venue prospects didn’t come to anything for a variety of reasons but after, popping in one day to The Lightbox in Woking ,I suggested we approach them for use of their Art Fund Gallery which is on the ground floor and available for community hire.. The space and situation it offered was excellent and their contract included physical installation and take-down of the Exhibition; insurance; labelling (with wording supplied by us); necessary equipment and featuring our Exhibition in their own marketing and dealing with any sales. The contract was signed after we submitted an Exhibition proposal to the gallery. The only problem was that we had to wait until February this year to stage the Exhibition as spaces are booked so far ahead. Slowly but surely, the action plan came into bloom. Fifteen members of Thames Valley group initially confirmed interest in being involved in the Exhibition and contributed to the advance deposit – an amount which also met the requirements of the OCASA funding. Contribution. Suggestions and voting took place for our ‘official’ name/public face which became Open Art Collective. Monica acquired a domain name, built our website and sought ideas for a logo – again chosen via a whole group vote. Thames Valley group members as a whole were kept informed of progress through a regular slot at our monthly meetings and a separate Facebook page was set up for exhibitors to enable speedier communication when necessary. During this period we also had the benefit of advice on setting up an Exhibition from photographer David George (a founding member of Uncertain States the lens-based and artist-led collaborative project) who spent a day with Thames Valley Group in April 2017 (see here) . OCA graduate Keith Greenough, a long-term Thames Valley group member also ran a session on planning Exhibitions for us in February 2018. The pace began to quicken in May 2018 when we were asked to provide a short blurb and a keynote image in readiness for the Lightbox advance publicity which went out online and in print in September 2018. Detailed submission guidelines were sent out to everyone involved, with initial shortlisting taking place on 6thOctober – by which time the number of exhibitors had reduced to eleven owing to pressing work commitments. I learned much from my co-curator, Dawn, as she modelled the process when the two of us looked at the work submitted – all on one theme yet each so different and individual. We spread small prints on the table, shared what came to mind as we looked and saw patterns emerging as we moved them around, with some double-checking against larger prints. As the curatorial theme evolved it became a curatorial statement, written by Dawn, which we then presented to the rest of the Steering Group together with a draft layout. Although the Lightbox contract included their own social networking/marketing there were other networks that could be approached. Sue worked on a draft press release which OCA Head Office were asked to ‘approve’ and Monica compiled an e-flyer. Jonathan approached various newspapers and magazine outlets at the right point to meet their publication deadlines and Sue later contacted available OCA networks. At times it seemed an unreal venture with such a long wait and communication with the gallery wasn’t always straightforward. Considerable time was spent gathering information from exhibitors about their work at various stages as sizes changed according to framing decisions and label information was a puzzle as well – how much/little to include. I kept worrying that we wouldn’t have enough space on the walls for it all as the walls kept expanding and contracting in my imagination despite our detailed layout plan and continuing reassurances from my much more experienced co-curator. We also had lengthy discussion as to the value of a special event and what it should be called/viewed as, eventually agreeing on an ‘Artists’ Evening’ which seemed less formal whilst still being celebratory. Jonathan made initial enquiries at an early stage which were followed-up and confirmed with the gallery by Teresa. Yes – I felt anxious and stressed at times through being so new to it all, but everything settled and became real during the run-up week. Artist information had been provided to the Lightbox in readiness for preparation of labelling in their in-house style and Monica had printed out price-lists and an Artist Information hand-out. Most of the exhibitors were able to bring work to the gallery themselves on installation morning (4thFebruary, 2019) and it was wonderful to see those blank walls and know that our work was going to be up there by the end of the day. Although James, our Lightbox technician, did the measuring and actual installation Dawn and I, and Teresa later on, helped with placement so at least I had some experience of actually installing an Exhibitions. The more detailed Exhibition layout we had provided also helped considerably in ensuring all the framed prints were in the right combinations. The labels would be printed out and fixed later on but we attached mock-ups to confirm placement. I called in the next day to make sure everything was in place, including Artist leaflets/cards and the comments book. It was such a wonderful feeling to see it all, glowing so serenely under the lights – looking just as we had envisaged. All the thinking, talking, discussing and agonising became worth it, even more so on the Artists’ Evening during the first week when family and friends came to see what we had achieved. So far as my own work was concerned, I do think it took somewhat of a backseat as I was focussed more on learning how an Exhibition gets organised. For me though, time in a wider sense gets measured very much by the time of year. Autumn is my favourite season with its glowing colours as a last burst before Winter sets in. I spent quite a lot of time taking photographs in Valley Gardens in Windsor Great Park and so I chose Autumn Trees for my Exhibition prints. Due to my own A3+ printer being determined to spurt ink drops on the edges of my A3+ prints I ended up having the images professionally printed, by the Printspace . Not my first experience of professional printing which I have had done locally once before, but certainly my first experience of ordering on-line and having test prints done first to check on colour quality. I would certainly use the Printspace again. This entry was posted in Uncategorized on March 13, 2019 by Catherine. Hello, here I am again, beginning another journey but this time in Landscape -the air I breathe; the planet where I live; memories of other landscapes in other times; the layers holding the history of all those who have gone before me. Where to begin? Let’s see. This entry was posted in Uncategorized on April 30, 2018 by Catherine.